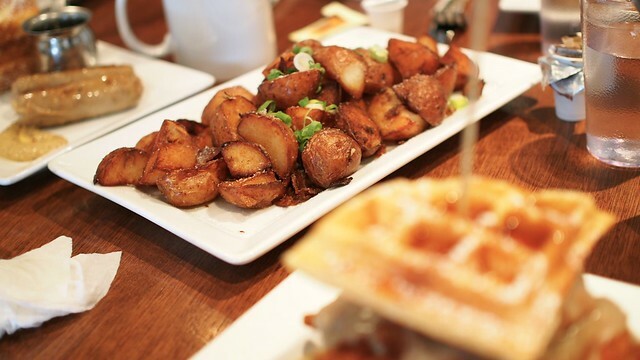 Brunch at Yolk's Breakfast Restaurant & Commissary on East Hastings in Strathcona on May 22, 2014. On this Sunday morning, I joined the Cheng family for a family style brunch at Yolk's über popular restaurant location on East Hastings. After a forty-five minute wait, we were seated and hungry. I felt obligated to try the notable chicken and waffles (with organic fried chicken, Belgian waffles, chicken gravy, and Canadian maple syrup) and it didn't disappoint with a nice, well-cooked piece of chicken with all the fixings. 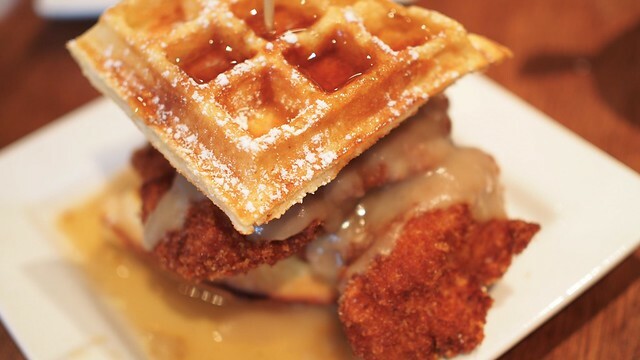 The waffles themselves were pretty standard on their own. I found the truffle-lemon hash browns (with organic potatoes, lemon, truffle oil, sea salt, and chives) quite delightful and was tasting truffle all afternoon. 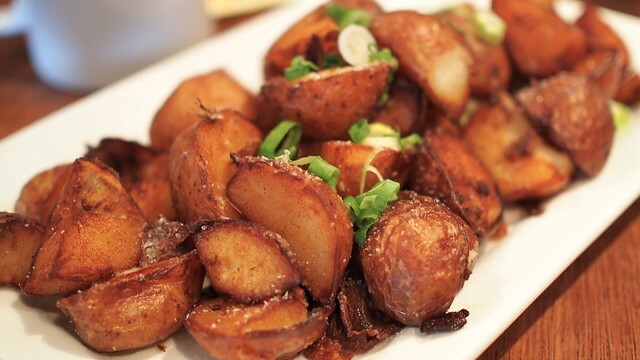 It's a perfect side dish to complement your entrée. 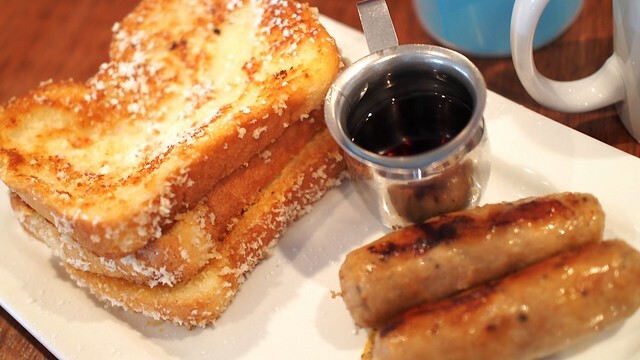 We all shared the French toast (with maple syrup and English bangers) and it was simple yet satisfying. They came with a side and we were recommended the sausages as they were also quite savoury. Our friendly and chatty repeat waitress generously served us some complimentary beignets (with salted caramel dip and icing sugar) hoping to make us regulars. 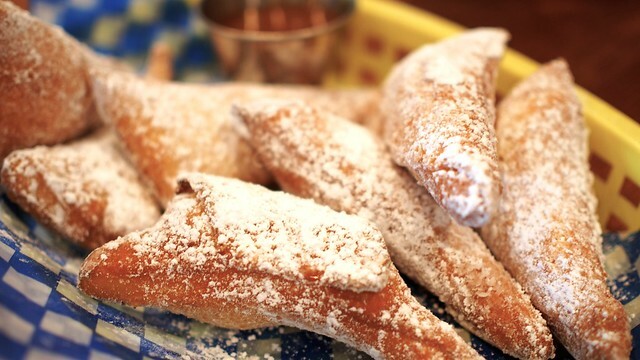 They were hot and delicious in all their sweet glory. 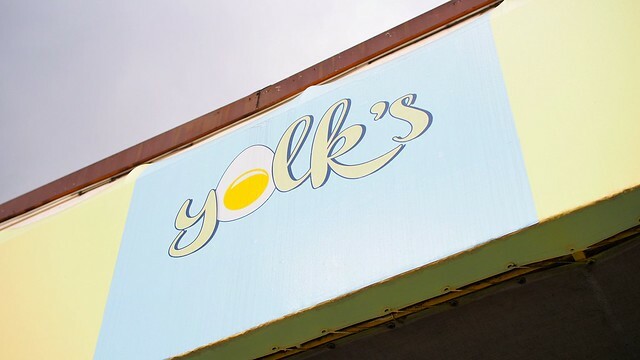 For the breakfast aficionado, Yolk's should definitely be tried. It's nice to see their busy operations after expanding from their popular food truck. Come early or slightly off peak hours to avoid a lengthy wait. I can see what all the hubbub is all about. Om nom nom.